Are you an artist, student, maker, DIYer, or simply just love a bargain? 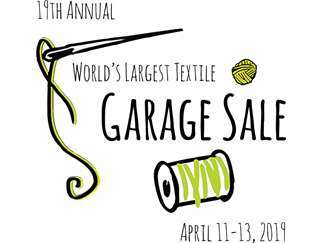 Join us for a celebration of thrift and fiber art! With shelves stacked high with fabric, yarn, patterns, tools, sewing machines, books, notions and more at garage sale prices, the possibilities of what you can create are truly endless! Here’s how it works: Individuals and businesses donate fabric, yarn, thread, notions, kits, patterns, books, beads, buttons, sewing machines, tools, looms, specialty equipment – filling a warehouse of textile finds! These treasures are then resold at garage sale prices to YOU. Donations are tax deductible and it all benefits Textile Center’s programs. Cost: Friday's Preview Sale - Advance Admission: $30/$25 members, Door Admission: $35. Saturday's Big Sale: $3.